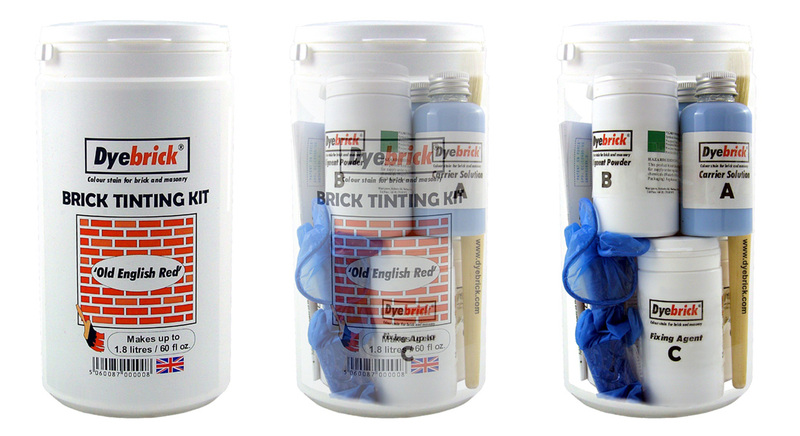 The Dyebrick Brick Tinting Kit is a patented brick staining kit. It is available as a three-part mixing system designed for the DIY enthusiast to produce a natural, permanent colour stain to brick, mortar and a variety of masonry surfaces. The surface of the masonry remains unaltered except for the required colour modification. Dyebrick allows your brick and masonry to breathe and is classified as Class 1 Vapour Permeable. Mixing is as easy as ABC! Dyebrick tints are a blend of finely ground, inorganic, micronized iron oxide pigments conforming to American Society for the Testing of Materials (ASTM) - Designation C979 and European Standard DIN EN 12878. They are then modified to produce the finest brick colour stains in the world. Although Dyebrick works on most brick types, we recommend that you try our sample pots first, to ensure that the desired colour and shade can be achieved and that the dyes can 'fix' to your brick or masonry. HORIZONTAL SURFACES (PATIOS or PAVED AREAS): Dyebrick colour stains are not recommended for horizontal surfaces. The level of durability on horizontal surfaces will depend on the type and quality of your masonry, the degree of exposure to the weather, residual ground moisture, mechanical wear (traffic), accidental spillages, de-icing salts and various domestic cleaning activities. Because of all these variables Dyebrick is not able to provide a guarantee for any of their products used on horizontal surfaces. DAMP MASONRY: Dyebrick should not be applied to damp or wet masonry. HIGH TEMPERATURES: The recommended temperature range in Fahrenheit for applying Dyebrick is between 60° and 85°. Dyebrick should not be applied if the temperature is above 95°. Dyebrick should not be applied to brickwork exposed to direct sunlight when the temperature is above 75°. LOW TEMPERATURES: Dyebrick ideally should be applied in warmer weather. However, if using in winter-time then it should only be applied when the temperature is 40° on a rising thermometer. STONEWORK: Dyebrick is only effective in colouring certain types of stonework. Trials need be carried out to assess the suitability and compatibility with your particular masonry. Some masonry types are very porous and also have high psv's (polished stone values) which make them difficult to tint effectively.PLEASE NOTE: The Dyebrick Lifetime guarantee only applies to brickwork and does not apply to stonework. CONCRETE: It is possible to colour certain concrete units, but not many. Trials must be carried out first to assess the suitability and compatibility with your particular masonry. Please note that the Dyebrick Lifetime guarantee only applies to brickwork and does not apply to concrete. ROOF TILES: Dyebrick can be used to restore and enhance old faded concrete and clay roof tiles. It is only suitable for uncoated, natural concrete and clay roof tiles and should not be used on modified acrylic slurry-coated tiles or tiles with a glazed or sealed surface. Quite a few tiles manufactured over the last 10 years fall into this category, so please check first. The Dyebrick Lifetime Guarantee does not apply to roof tiles. However, we do supply a 5 Year Guarantee against colour loss or fade. Vertical clad tiles are covered by a Lifetime Guarantee. Concrete roof tiles can absorb a lot of fluid, so please test the coverage rate of your tiles first. See how many tiles you can coat using 1 litre of water first, this will give you a guide on how much to purchase.